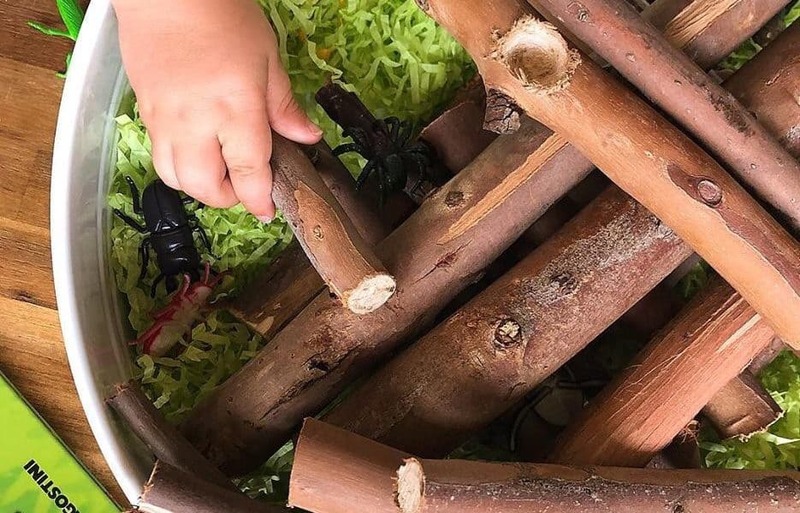 Home / play / Mini Beast Sensory Discovery! We are huge fans of bugs at our house. There isn’t often many days between a little six legged friend joining us in play in the girls little bug box before being re-released back into the garden again. Today, we kept our insect play based around our little toys insects. 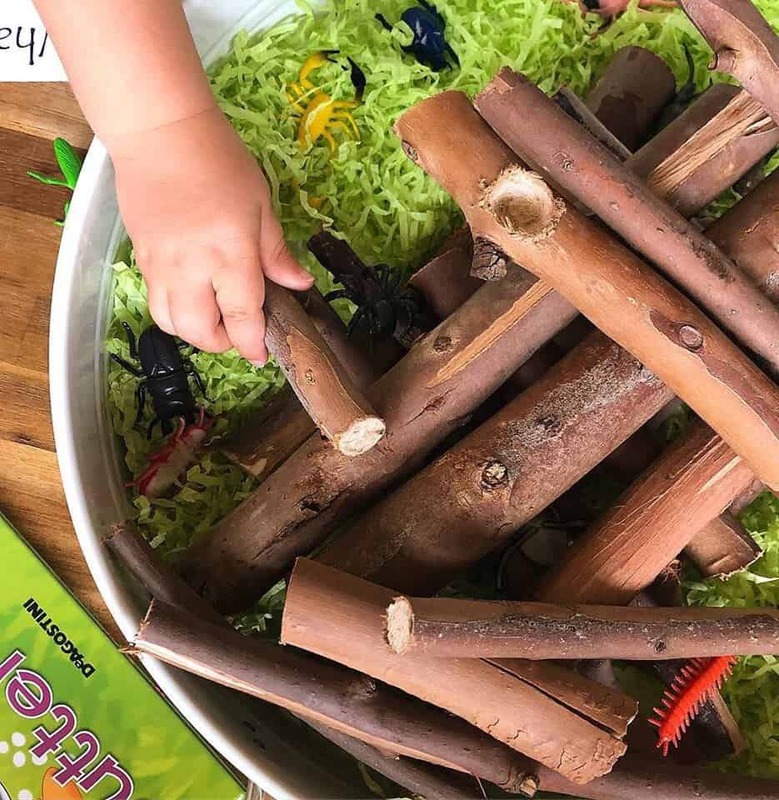 Sensory play is always a hit and with so many learning opportunities that stem from it, I was excited to set up this Mini Beasts Sensory Tray for Miss 2. 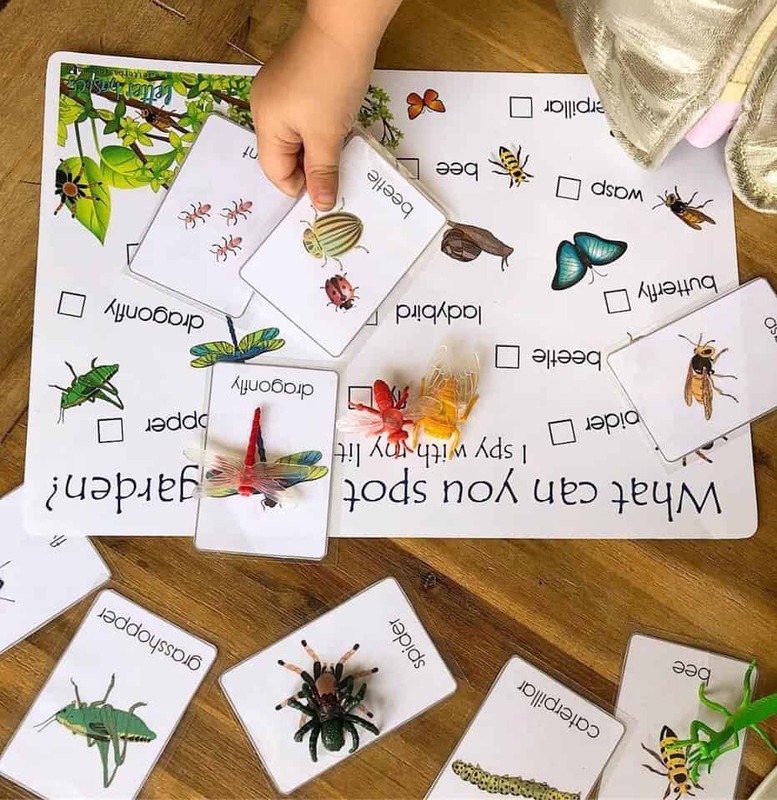 The aim of the activity was to encourage her to search under and around the mediums and match the insects with their corresponding pictures on the checklist or flash cards. Searching for patterns is an important pre-literacy skill. 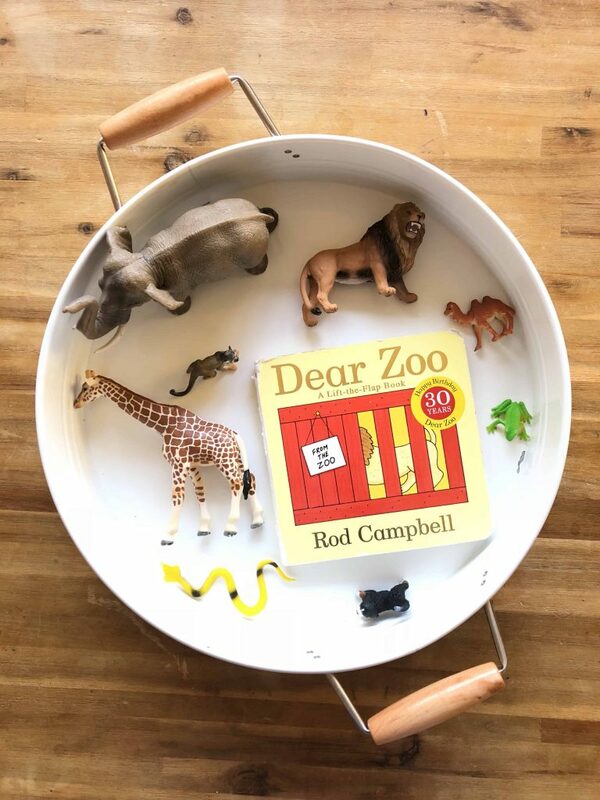 Scanning the tray and then matching the toys with their pictures is a great way to practise this skill in play. 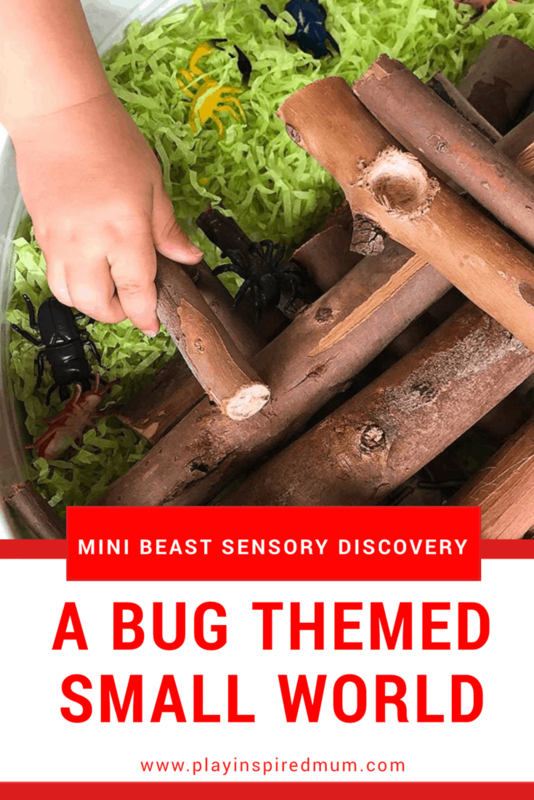 How to Set Up Your Mini Beasts Sensory Discovery. 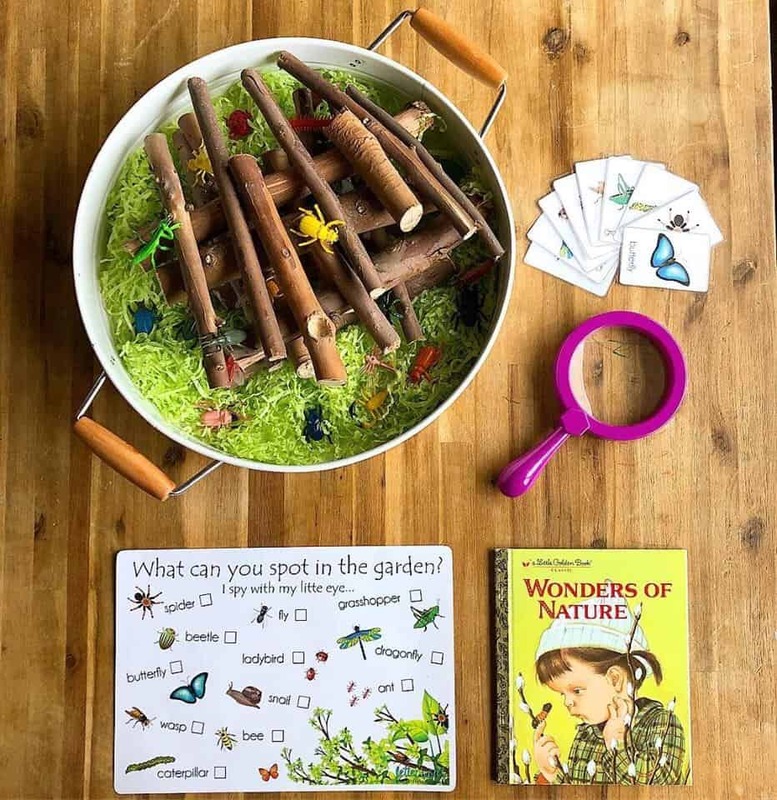 This activity is super easy to set up. Spread your shredded paper across the base of you play tray. Stack your branch cut offs ensuring there are gaps between your branches to hide your insects in. Our first layer had four branches laid vertically, four on top of those horizontally then four vertically etc until they were used up. Hide your insects around your little log pile. I had some hidden in plain sight and then others were concealed. 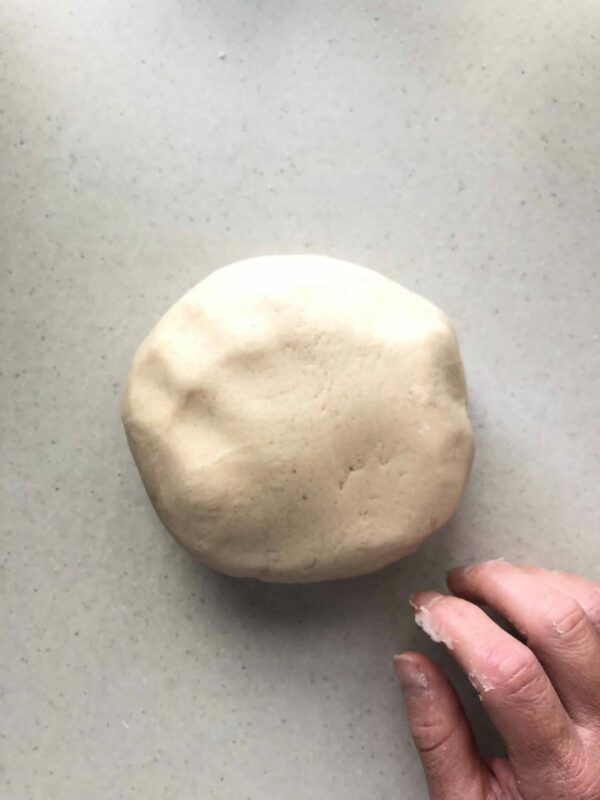 While Miss 2 is only still young, I felt it is important that this activity should offer its challenges, however also not be to difficult either. With her fingers twitching, Miss 2 was really looking forward to getting amongst this activity. 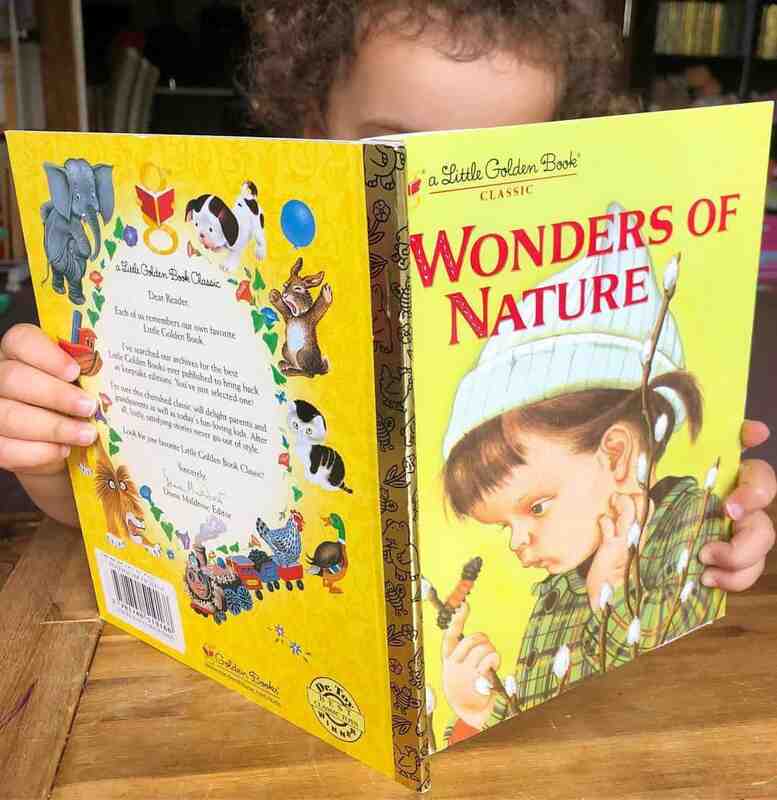 Before letting her loose, we read her book, ‘Wonders of Nature‘. This really is a lovely little book with fast facts, beautiful illustrations and a running theme of creating awareness of the little treasures that nature presents us with. 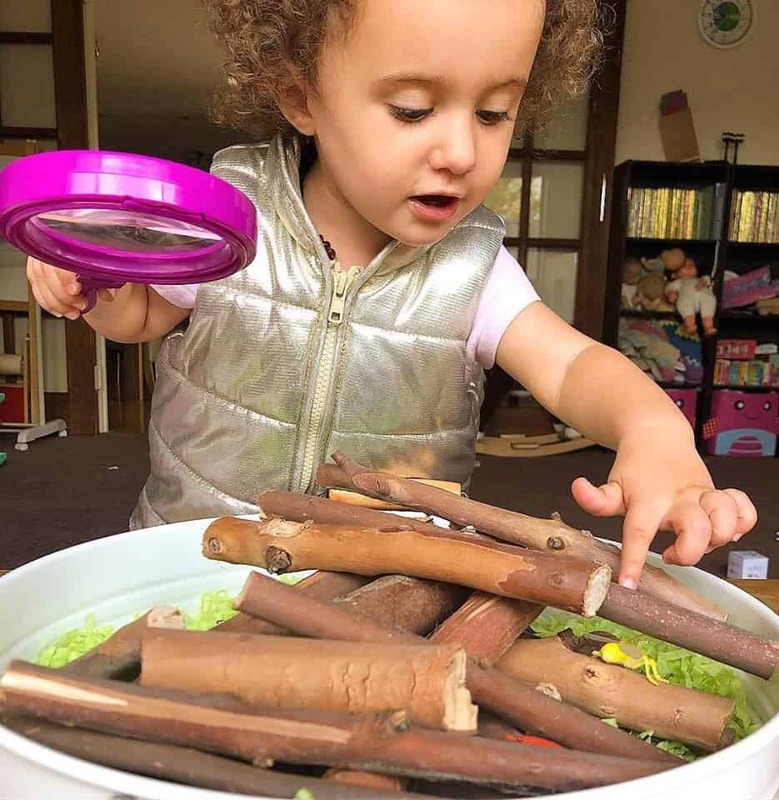 With a quick journey across forests, the deserts and seas in our little story, Miss 2 was excited to explore our little sensory set up just as the children had done in her book. 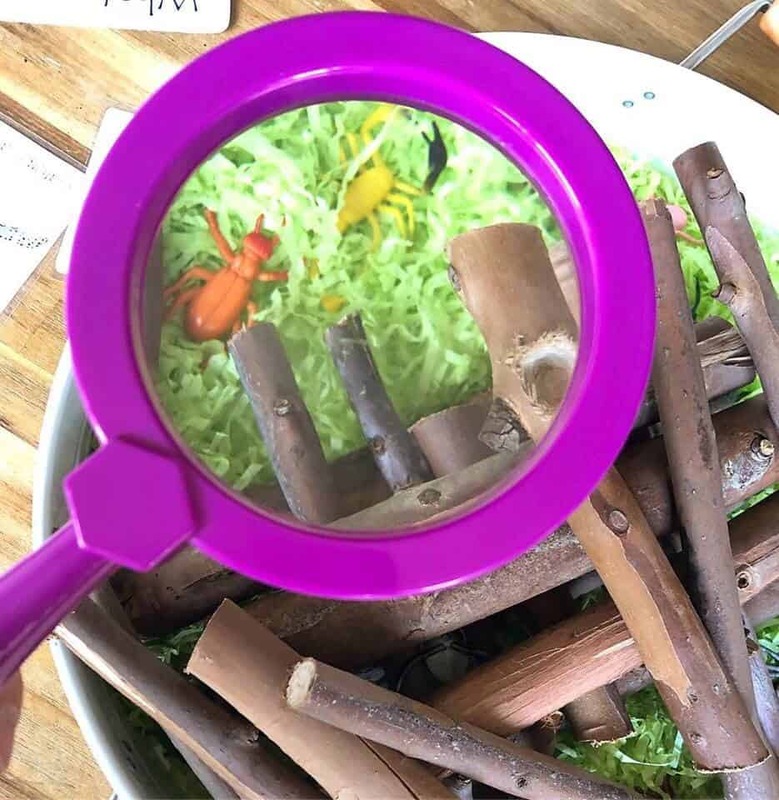 Without much mention of the learning resources accompanying the play tray or the play brief, Miss 2 got busy discovering the insects lurking amongst the branches and nest of green. Inspired by her book, she held her magnifying glass high to her face and began to discover what was lurking amongst the branches. Her face beamed when she discovered some familiar insects. Miss 2 worked at retrieving her target without disrupting the branches. As she was examining the best way to navigate her way to her beloved fly, she discovered more and more little insects hiding in the shadows. While she was pointing out the insects, I asked her questions. How many legs does this creature have? What colour is the beetle? Where do you think we would find a dragonfly in our yard? What do you think the fly would like to eat? How many insects can you see on top of the log? Mostly, she answered them proudly. The rest we spoke about just quickly enough that she heard the answer. After about ten minutes of exploring, her attention began to drift. This is when she started to look at the resources that were around the tray. 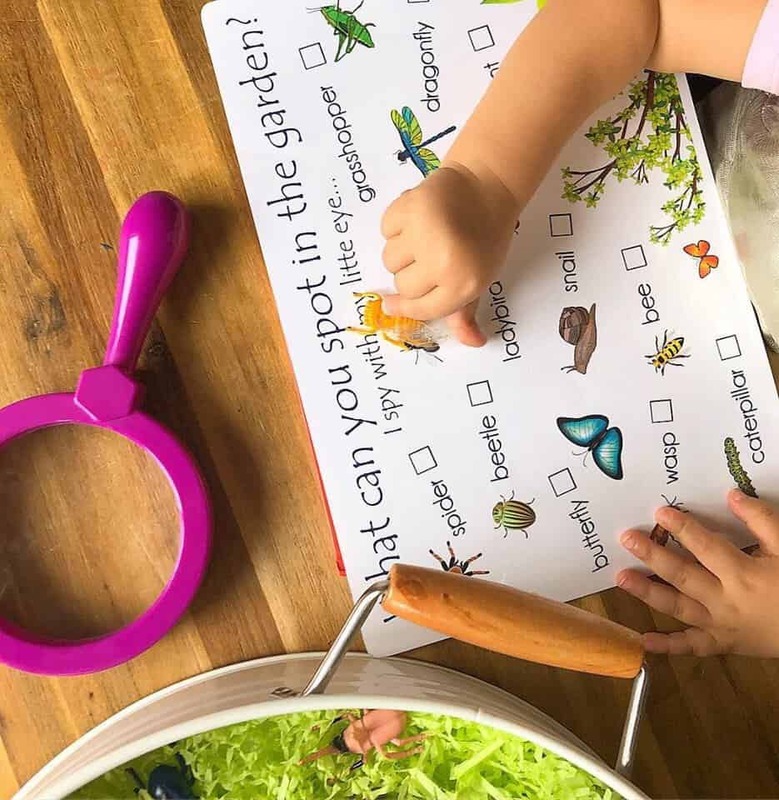 She recognised some of the insects on the activity sheet and began to match the toys with the pictures on the mat. 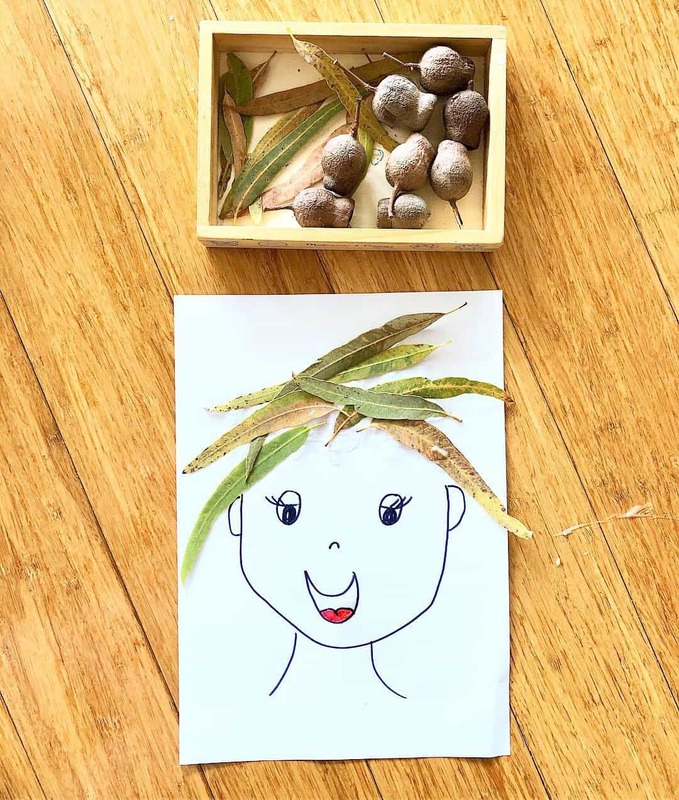 She placed the toys on top of the illustrations on the Activity Sheet. Before to long, the mat was covered. In saying this, she still had plenty of insects left. This is when I bought her attention to the flash cards. Inspecting each one, she named the mini beasts that she recognised and asked what the ones were that she didn’t. These were then also used to sort her mini friends too. I began to join in adding a little trick question here and there. She took a lot of pride in correcting my mistakes. This activity held her attention for close to an hour – that does not happen often! Throughout this hour, many learning opportunities were presented. Another success! 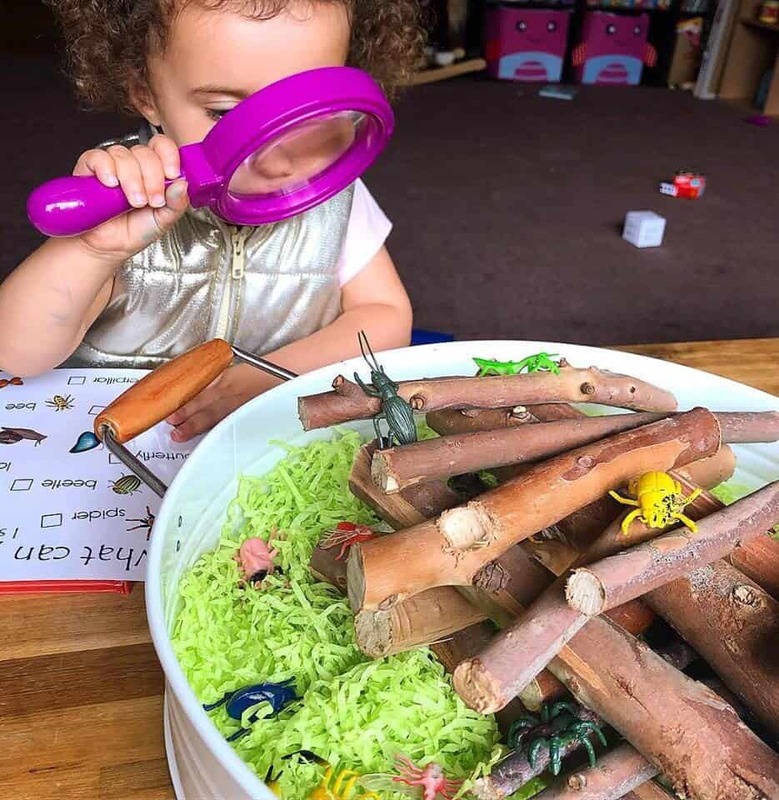 Playing with mini beasts is always fun – learning through play is even better! Are you going to give this a go? We would love to see it too! Feel welcome to share your interpretation in our Facebook Group! Love playing with bugs? 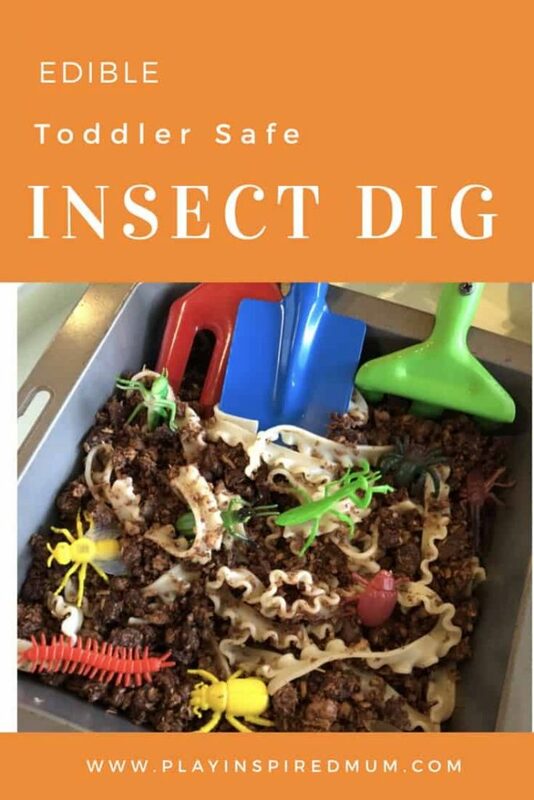 Check out this Taste Safe Sensory Play Idea!